Northern Rail is the primary train operator in the north of England. Northern Rail plays a vital role locally by connecting tens of thousands of people to work, leisure, education and more every day. Northern Rail operates more stations than any other train operating company in the United Kingdom. When Northern Rail approached us, they didn’t have a digital system that could process and translate their operation notices documents into a convenient digital form. Northern Rail’s previous operations notices system was based on vast amounts of PDF and paper documents that they received directly from Network Rail. It was our job to build a mobile app that would translate Northern Rail’s PDF and paper systems into digital form so that staff have quick and easy access to the correct documents. 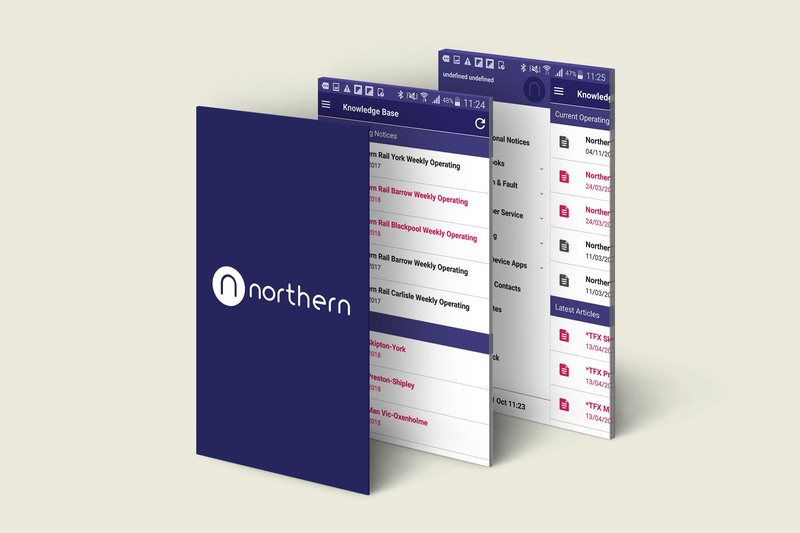 We worked with Northern Rail to build a knowledge base mobile app that would digitise their operations notices documents into a single mobile app that could easily be used by their staff. As Northern Rail didn’t have a digital operation notices system at this point, we needed to convert all of their PDF and paper documents into HTML format. The difficulty of this was ensuring that the HTML versions of documents maintained accuracy to the PDF documents. To solve this issue, we needed to find a way that the PDF documents could be translated into HTML, without breaking them or incorrectly changing the size of the files as Northern Rail had a restriction on bandwidth limit. To convert the PDFs into HTML, we examined various conversion routines to identify the one that would meet Northern Rail’s technical requirements. We chose a conversion system to allow simple conversion processes where users can simply drag and drop a PDF file into a folder, which is then automatically converted and stored in the app. Once we found a way to translate Northern Rail’s library of documents into HTML, we faced the challenge of fine-tuning the HTML files for optimal performance. To solve this, we used our own custom content management system (CMS), Cadenza, to build the overall framework of the app. While Cadenza is built primarily for custom websites, we were able to build a feed in it that integrates content from Northern Rail’s server into the knowledge base mobile app. We also built a feed function with an automatic audit element so that each feed records which member of staff has requested information so that any further requests do not include any repeated information. We also created a backend system in the Mobile App where users can create articles in a function similar to creating web pages in a CMS. This means that Northern Rail staff can create their own notices and publish them using the app. Users can also submit staff feedback through a form in the app’s backend, which allows messages to be sent between staff. Given the size of Northern Rail’s network, we implemented a system that recognises which depot a user is based in, and the app then connects the user to the correct Northern Rail server. As each depot receive their own individual operating notices the app determines where the user is located and interacts with Northern Rail’s database to identify the serial number from the mobile being used to supply the user with the specific operations notice for their depot. Northern Rail knowledge base app took 3 months to create and implement. We assist you with the full mobile app development journey, from initial strategy and concept, through to app testing and launch. We believe in providing real value for your business, this is we develop all of our mobile app solutions in-house: on time and on budget. We have been around since mobile apps began, and have helped some of the UK’s largest organisations, such as Northern Rail and London Overground, to refine their business operations and customer services with a mobile solution.